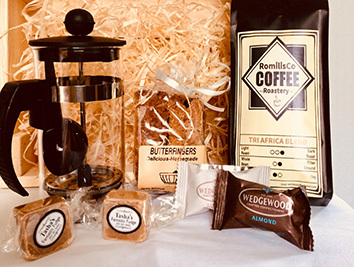 Gift Hampers Online was birthed in May 2017, due to my passion for giving gifts with a personal touch. I personally source quality products, supporting local and small businesses. 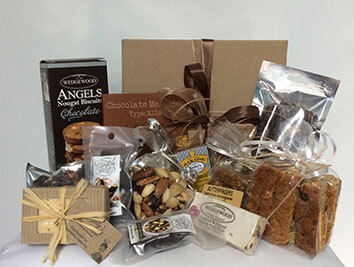 I have a selection of standard gift hampers and hampers for special occasions. 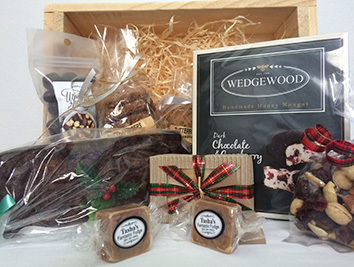 You are welcome to make up your own hamper according to your personal taste and budget. I can also make up corporate orders, including your corporate items & or colours. Please note: Free delivery in Pietermaritzburg. We can courier anywhere in South Africa. 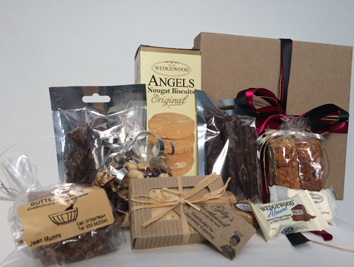 Two piece shortbread, two nougat bon bons, two fudge bon bons, 50g biltong, 50g dry wors, 50g crunchies, 100g rusks, 80g mixed nuts & 150g Angel biscuits. 4 piece shortbread, 35g almond roca, 35g coffee crunch, 80g mixed nuts, 80g biltong, 80g dry wors, 150g Angel biscuits, 50g nougat bar, 50g crunchies, 150g rusks, 50g fudge and 80g chocolate milk slab. 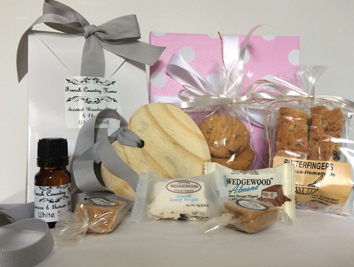 Scented wooden heart, 100g rusks, 50g choc chip cookies, two nougat bon bons and two fudge bon bons. 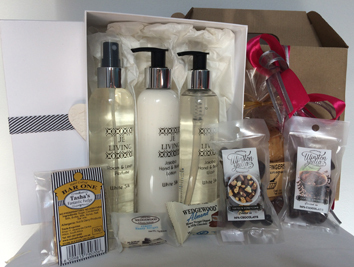 Gift boxed body lotion, body wash & room perfume, 50g choc chip cookies, 35g almond roca, 35g coffee crunch, two nougat bon bons & two fudge bon bons. 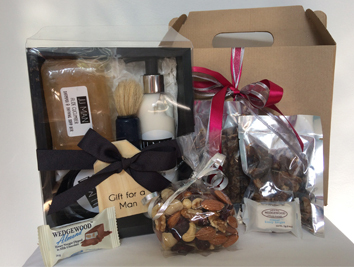 Gift boxed soap, shaving brush & body lotion & sugar scrub, 50g biltong, 50g dry wors, 50g mixed nuts & two nougat bon bons. 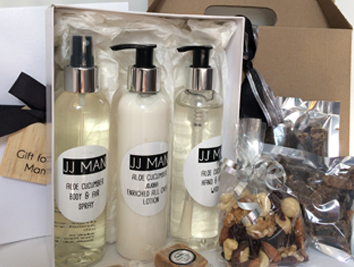 Gift boxed body wash, body lotion & room spray, 50g biltong, 50g dry wors, 50g mixed nuts & two fudge bon bons. 2 fudge bon bons & 140g chocolate nougat box. 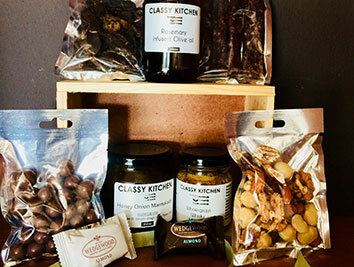 Olive oil, onion marmalade, whisky mustard, 2 nougat bon bons, 50g biltong, 50g dry wors, mixed nuts & chocolate shortbread balls in a box. 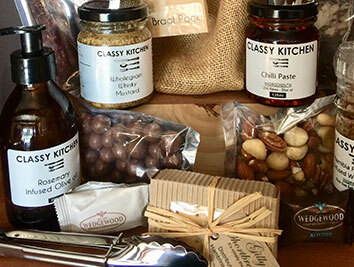 Braai tongs, whisky mustard, chili paste, olive oil, braai salt, 2 nougat bon bons, shortbread, mixed nuts, 50g biltong, 50g dry wors & chocolate shortbread balls in a hessian bag. Full out the enquiry form below to place your order today!